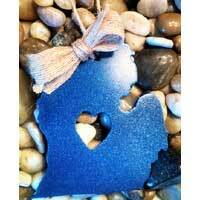 Show your love of Michigan with a Metal Open Heart Lower Michigan Ornament. This Metal Open Heart Lower Michigan Ornament is made of 16 gauge steel and available in Metallic Blue or White. The Lower Michigan Ornament measures 5″ x 4″ and comes with ribbon. Show your love of Michigan with a Metal Open Heart Michigan Ornament. 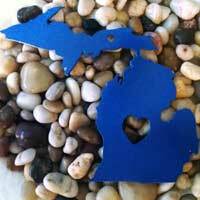 This Metal Open Heart Michigan Ornament is made of 16 gauge steel and available in Metallic Blue or White. The Michigan Ornament measures 5″ x 5″.